Despite not being part of traditional society, flags were quickly adopted by Māori and given an important role in their culture. 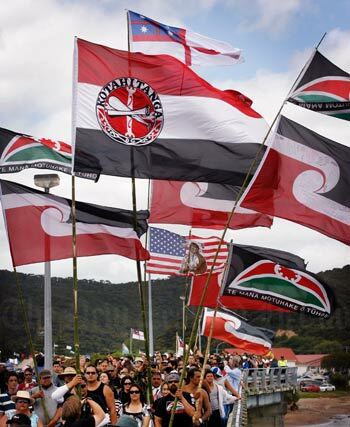 Māori have used flags in tribal, political, religious and other social contexts. Māori were introduced to flags by Europeans, and they quickly became part of Māori culture as symbols of mana and to show allegiances. Missionaries introduced flags to Māori, and some Māori villages flew flags on Sundays. From the 1830s flags were often flown on hākari stages, which were built to display feasts. James Busby, the British resident (an official position), decided that New Zealand needed a national flag. In 1834 northern chiefs were invited to Waitangi to select a flag from three options. The winning flag became known as the flag of the United Tribes of New Zealand. After the Treaty of Waitangi was signed in 1840, making New Zealand a colony of Britain, the Union Jack became New Zealand’s national flag. Flagpoles flying the Union Jack were sometimes cut down by Māori in protest against British rule. The Pai Mārire faith, followers of which were sometimes known as Hauhau, would fly three flags on a tall pole during religious ceremonies. The five apostles (messengers) of the movement each had their own flag. Te Kooti, who founded the Ringatū religious movement, used flags when fighting. Flags were often captured by opponents in battle. Te Kooti captured one of his most well-known flags, Te Wepu (the whip), from Ngāti Kahungunu in 1868, and it was captured from him two years later by a British captain. Other Māori prophets often had their own flags. Māori independence movements, including the Kīngitanga (Māori King movement) and Kotahitanga (Māori unity) parliament, used flags. Every Māori king and queen have had their own flags. Māori who fought on the side of the Crown and settlers in the 19th-century New Zealand wars also used flags. Māori who defended settlers in Whanganui in the 1860s were given a flag in appreciation of their actions. Flags have also been given to tribes by British royalty. From the 1970s Māori have flown flags as symbols of protest. One the most common is the tino rangatiratanga (self-determination) flag, which was designed for a protest group in 1989. In 2009 the tino rangatiratanga flag was selected as the national Māori flag.